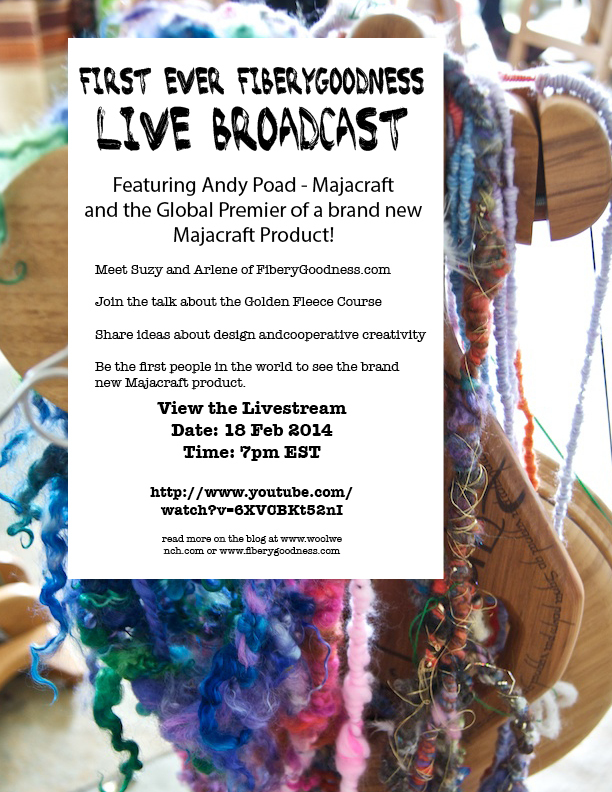 Home » Events » First FiberyGoodness Live Broadcast and… Majacraft New Product Reveal! Remember a few months ago I was in New Zealand? And I was visiting at Majacraft? Glynis made mention in their newsletter that we had spent some time in the design room while I was there. One of the outcomes of that was the creation of the circular looms that Arlene (SpinArtiste) and I had been discussing with them for a while, in conjunction with our Golden Fleece course. The OTHER thing that we were doing at that time was also seriously cool, I haven’t been able to tell anyone about it yet, but it was a continuation of an on-going development that we had started way back at the beginning of 2013, something a bit more complex than the circular loom, a bit bigger, and a lot more technical. It was something that went through the drawing stage, involved various ideas sent back and forth that were used, or dumped, or modified, adapted, and tweaked. Then it went to the prototype stage, as Andy created the design that so far looked great on paper. It looked great in reality too, only… it didn’t work in quite the way it should have. At this point it was put aside for a short while.. thinking time. We continued to discuss it (yes ok I continued to nag about it) and the plan was that when I was there, we would take another look at it together in the workshop and see what could be done. There were a couple of key features that I was determined it should keep. And guess what, during the testing of the first prototype, we came up with the perfect solution! And it was, of course, the simplest one. It did mean scrapping some of the first cool ideas, but Andy is the Design King, and the final solution he has now created is no compromise, it’s a very elegant product and I am sure when you see it you will agree! Now ‘it’ works perfectly, better than perfectly. It is awesome. I don’t think I am saying this just because it is a bit ‘my baby’, I really think its going to blow many socks off 🙂 And it will be revealed in just over a weeks time! We will be running our very first FiberyGoodness live broadcast, it will be the first of many, and the plan is to interview one of our Fiberygoodness affiliates, one of our sponsors, or a course participant, in each broadcast. For our very first broadcast what could be more perfect then, than an interview with Andy of Majacraft, this company’s backing has been a fantastic boost to our Journey to the Golden Fleece course, right from the start. We will talk about the circular loom, the course, and… REVEAL THE SECRET!! – the brand new Majacraft product will be launched with this premier live global event! We are honoured to be able to bring you this exciting world first, as an extension of my involvement the development of this product, which ran alongside the development of our Golden Fleece course, nothing like multi-tasking is there! Also we are celebrating a constructive relationship between FiberyGoodness and Majacraft, based on a shared vision of community and cooperative creativity. And of course, Arlene and I are convinced that this new product is just the thing for our Journey to the Golden Fleece participants and something we are sure they will have a big interest in, even if not for now, certainly for later! Watch this space, the Majacraft Blog, Spin Artiste (and my Facebook Page) for all the details of the Live Broadcast, we have a YouTube link where you can watch it AS IT HAPPENS! You will even be able to take part by posting your questions and comments during the broadcast so we can respond to them in realtime, during the livestream! We hope you will be as excited about this as we are! WOWZER!!!!! You must be BURSTING with *****ExCiTEmEnT***** !!!! I AM!!!! CAN’T WAIT!!!! and i am so impressed. this is like lexi reinventing the wheel in spite of people saying you shouldn’t bother with reinventing the wheel. i can’t even imagine what this will be, but it sounds like another fantastic reinvention of the wheel! 🙂 !!! Can’t wait to see the new product you help develop, How exciting! I’ll be watching. Very excited to hear about a new Majacraft product that you participated in Suzy! I’m a Magicraft girl myself! Looking forward to the broadcast! I hope everyone is going to love this, its been a while now and you know me, not the most patient person in the universe 🙂 Its a relief to be able to share this soon!